What is Radio Club anyway? Are you interested in joining radio club, or maybe just want some cool podcasts to follow on the bus to school or work? Ryan Cox interviews Charlie Hanacek as he describes the up and coming BHS Radio Club. Highlights include the possibility of future live streaming, and sweet shows, and why now is the time to get involved! 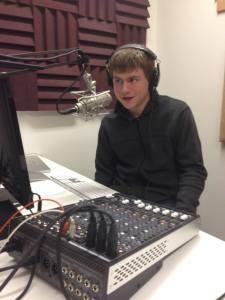 For the aspiring student radio broadcaster, the club meets Thursday mornings at 7:45 in Mr. Dunn’s room. To check out our collection of Bainbridge On Campus podcasts, visit our On Campus page. Credits: BCB host Ryan Cox; BCB audio editor Charlie Hanacek; photo: Barry Peters.